This page provides general information on what to expect when exploring dungeons. Here, "dungeon" is being used as a general term to refer to the underground sections of all the various places in the game: e.g., caves, Dwarven ruins, mines, Nordic ruins, etc. Some of the information is also relevant to above-ground areas, at the entrance to a dungeon or in various locations containing enemies that are entirely above-ground. As part of Skyrim's Radiant system, most dungeons have the potential to host a range of randomly-assigned quests. Some quests will be assigned to any type of dungeon; other quests are only assigned to dungeons containing a specific type of enemy (e.g., bandits or undead). Boss: the final and most difficult enemy in the dungeon. Some quests will replace the boss with a quest-specific enemy (although this feature often causes bugs). Captive Marker: the location where any quest-related captives (e.g., kidnapped citizens) are put. Typically some type of cell. One implication of this system is that if multiple quests are assigned to the same dungeon, all of the quest-related items are put in the same place: multiple captives will be locked in same cell, or multiple quest items will be found in the same chest. 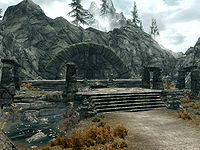 Many dungeons in Skyrim have a defined minimum level; some also have a maximum level. These levels do not determine whether or not your character can enter the dungeon. Rather, they determine the difficulty of the enemies located in the dungeon and the quality of the loot that will be found. [verification needed — Need in-game confirmation that both enemies and loot are controlled by dungeon level] Normally, all enemies and loot are generated based on your character's current level. However, if your level is lower than the dungeon's minimum level, the enemies and loot are instead generated using that minimum level — resulting in enemies that are more difficult to kill, but also higher-quality loot. Most dungeons are "clearable", meaning that once the boss is defeated, the dungeon is tagged as "Cleared". A (somewhat quiet) tone will play once this occurs. A cleared dungeon may still have unkilled enemies and uncollected loot. This status is shown on the in-game map, allowing you to identify which dungeons you have or have not visited. If a dungeon has been cleared, it will take longer for its contents to respawn. Its status remains as "Cleared" even if the occupants have all respawned. There are a total of 197 places in the game that can be cleared, although two of them (Angarvunde and Mistwatch) are atypical, as detailed in the next paragraph. Once you have cleared any 50 of the remaining 195 locations, the Delver achievement is unlocked. However, a significant number of dungeons cannot be cleared at all; the wiki page for each of these dungeons states "Clearable: No" on the page's infobox. Angarvunde and Mistwatch are the only locations in the game that are marked as cleared when a related quest is completed, instead of when the location's boss enemy is killed. The specific requirements necessary to clear these locations are detailed on their place pages. One consequence of being marked as cleared by a quest is that these two locations do not increment the Dungeons Cleared statistic or count towards the Delver achievement. In several other cases (detailed in the Achievements section), a "Cleared" tag appears when a nearby location has been cleared. Also, keep in mind, once locations respawn, they may be cleared again. When a dungeon respawns, its enemies and loot are reset. The specific occupants that you encounter in any dungeon are for the most part randomly generated and level-dependent. Most dungeon categories seem to have a preferred minimum level which applies to most of the dungeons in a category. See levels for information on the level used to generate the occupants. Most enemies are named based on their level. For example, a low-level Necromancer is named "Novice Necromancer", whereas the top-level Necromancers are named "Arch Necromancer". Most of the loot found in a dungeon is randomly generated based upon your character's level and/or the dungeon's level (see levels). The amount of gold you will find is level-dependent, as is the quality of the items that you will find. Item-related articles such as Armor, Weapons, Generic Magic Apparel, and Generic Magic Weapons provide details on the level at which various items can be found. Some items sitting out in the open. Unlike previous Elder Scrolls games, in Skyrim developers can place dummy objects, for example on tables or shelves. These dummy objects are then replaced by a leveled item when the dungeon contents are spawned. This is most frequently done with potions, but is also done for armor, arrows, books, soul gems, and weapons. Every boss chest is guaranteed to contain one special loot item. Most standard dungeon chests have a 10% chance of containing one special loot item. The Lockpicking perk Treasure Hunter increases this chance to 15%. Two of the clearable locations, Angarvunde and Mistwatch, display as cleared on your map but do not increment the Dungeons Cleared statistic or count towards the Delver achievement. Several other locations that may show up as "Cleared" on your map are actually secondary locations — the "Cleared" tag appears when the associated primary location is cleared. None of these secondary locations count towards the Dungeon Cleared statistics or count towards the achievement, and are not shown in the Cleared category, or counted in the above total of 186 clearable locations. These places include Giant's Grove, Klimmek's House, Shalidor's Maze, and Sundered Towers. Some locations have two map markers and therefore count twice towards the Explorer achievement (and cause "Cleared" to display two times on your in-game map), but still only count once towards the "Dungeons Cleared" statistic. These places include North/South Brittleshin Pass, North/South Cold Rock Pass, North/South Shriekwind Bastion, North/South Skybound Watch Pass, Steepfall Burrow with its lower entrance, and Reachcliff Cave with its secret entrance. Official Add-Ons and some mods may change the total number of clearable locations. This page was last modified on 20 May 2018, at 06:49.